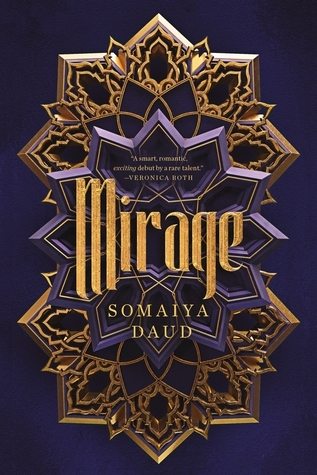 Mirage has been getting a tonne of hype lately (“lately” meaning pre-release, but I know it’s now October by the time this post goes up) and I totally fell for it. I thought it sounded like everything I loved. Science fiction about a conquered galaxy, a revolution, and some kind of fantasy other than English. Unfortunately, it didn’t live up to my expectations. I feel like the author had a good idea going on. The premise was a really good one, but I didn’t feel like it was fleshed out enough. It was really just the bare bones of an idea that never truly flourished, which is a damn shame because I was really excited for this world. I think the author should have spent some more time on the plot and the world building, because I think this one had a lot of potential. It was just never fully developed. The Moroccan-inspired culture, though, was very interesting. It was probably the best part of the book, and you could tell that Daud put a lot of time and effort into that part of it. I think it was clear which parts of the book she was passionate about. Also the love story was bloody awful. It was rushed, with no chemistry or real depth between the characters or with their relationship. That aside, I think Daud wrote a really good relationship between Amani, the main character, and the princess. I enjoyed their scenes very much. Overall, this was generic and more than a little disappointing, but the culture and representation was rich and is probably the only part that kept the book going. Oh wow, judging by your review 3 stars seems quite generous! I think scifi is such a hard genre to write, it can be so hit or miss and the only one i have ever truly loved is the illuminae files. I am all up for the rich and cultural rep in the book such this, I have seen others mentioned that it really wasn’t that fleshed out, but seeing your rate it is generous, hope to acquire a copy of it soon.